Have آپ watched the hillywood دکھائیں Dark Knight? چنیں پرستار: Yeah Harley and the Joker are so cool in it! Do آپ think the Joker loves Harley? What do آپ think Joker and Harley do in there spare time? His چھری digs deeper into her soft cheek. "What did آپ expect in this place? Its full of fruit loops and whack jobs. Its hardly gonna be a fun place to work" Sarah stated matter-of-factly. 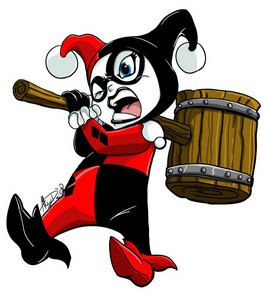 What is Harley's real name?